The Sunday Concert Series (also known as Sunday Serenades) at Scarborough Civic Centre is a staple in the community that is loved by its faithful attendees. Concerts will take place twice a month from September to the end of June. During the summer months of July and August, the Sunday Concert Series will go on hiatus. Each summer, Albert Campbell Square hosts many public events for the community to enjoy, and freeing up space inside the civic centre will allow some of those events to grow to include an indoor component. The 2019 schedule appears below. Please note: There is no reserved seating for any concerts. Concerts can be subject to change or cancellation due to extreme weather conditions. From Sunday, March 25 onward, the City of Toronto parking lot will remain available to Sunday Concert Series attendees. 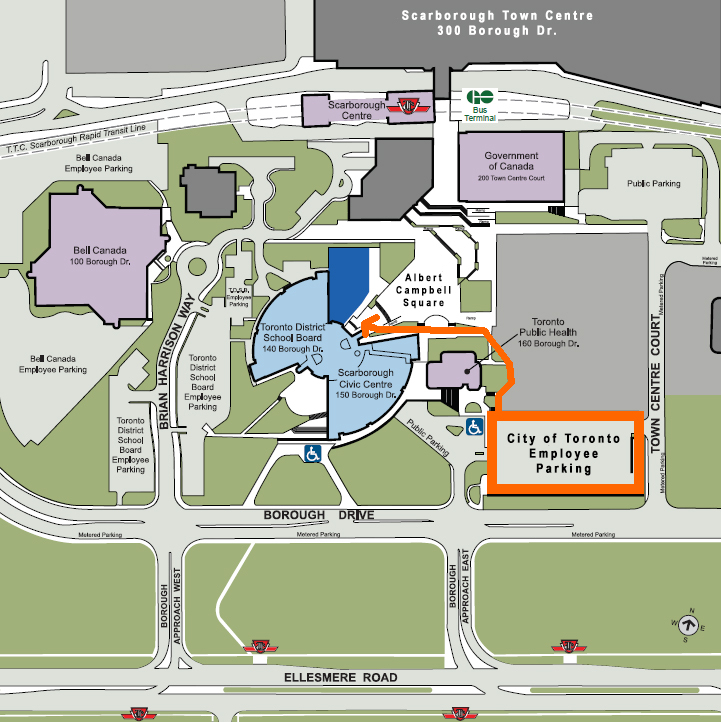 The City of Toronto employee parking lot is located at the northwest corner of Borough Drive and Town Centre Court, with the entrance to the parking lot located on Town Centre Court. To get to the civic centre from the parking lot, please leave by the northwest path heading north and following the path between the Toronto Public Health building and residential condominium. When entering Albert Campbell Square, turn left and follow the path leading behind the outdoor stage to the front entrance of the Scarborough Civic Centre. Below is a copy of the map in colour with the route drawn in. City staff will continue to discuss the availability of the TDSB parking lot for future concerts with TDSB Management. Further updates will be provided should there be new information to share.